My Attempt to Cook 100 Jamie Oliver's Recipes : Attempt #62: JO's Porridge! If you have school going kids and we have to prepare their breakfast and meal boxes for them, I think you will understand how challenging it is trying to think of new ways to make those bread, eggs or fruits interesting. 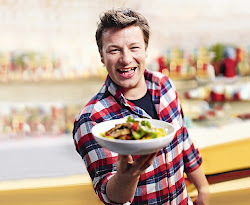 So, for the next few recipes, I will be concentrating on trying out Jamie's Breakfast recipes / ideas. Here's one of Jamie's Porridge ideas - Oats with Banana, Almond Flakes, Cinnamon Porridge. Drizzled with Honey! Yumz! Yummy , especially the lightly toasted almond flakes. It was an A+ from the adults but not the kids though. They are simply not a fan of oats!